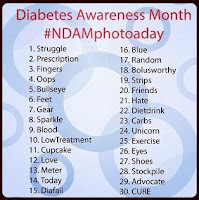 Today, November 14th, is World Diabetes Day. It's Sir Frederick Banting's birthday. In case you aren't familiar with him, he's the guy who discovered insulin, the clear liquid that keeps Bean alive. 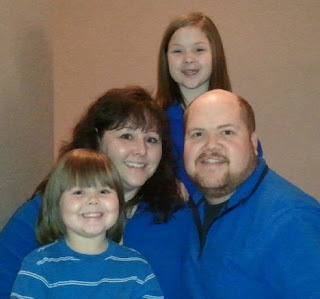 To support all those living with diabetes, we wear blue on this day. So Bean would feel some of that support outside of our house, I sent home notes with her classmates on Monday explaining WDD and asking them to wear blue for her. 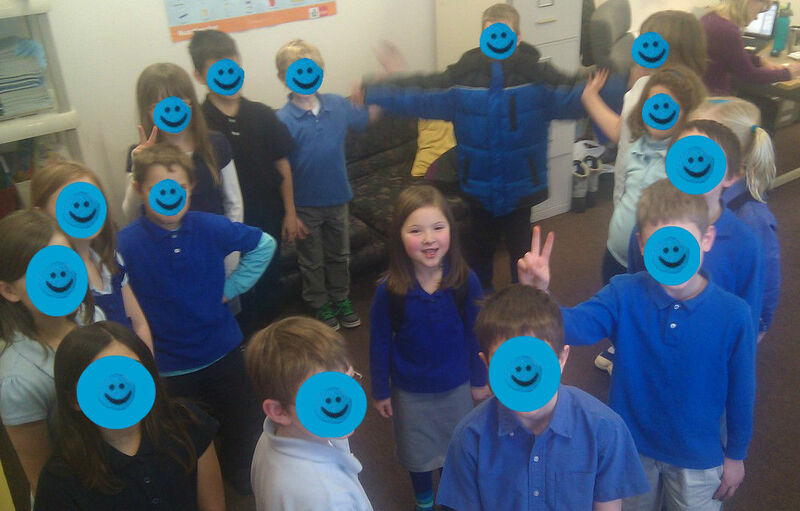 Yeah, I kinda got teary eyed when I walked into her room and saw that all of the kids (with one exception, but at least he had blue on his coat for the picture) had worn blue shirts to show their support for Bean. At the end of school, Bean handed out these treats....with the exception of the cookie, which they ate with their lunches. Here's what the Sweet Bean Family wore today to show our support for all of our friends and friends' kids who live 24/7/365 with this crazy disease! 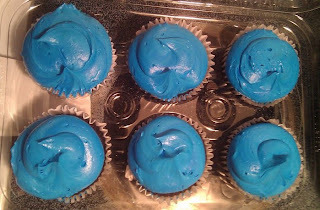 You can't possibly have a diabetes related celebration without these, which were made on the spot just for Bean at the grocery store after school. She was beyond giddy that the bakery lady would do that for her. 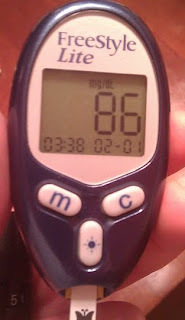 Oh, and because she had been complaining about being thirsty all night, Bug had a BG check. I feel blessed on this day to know so many amazing PWDs and CWDs and families. It's a group of people, but for a hideous disease, I wouldn't have known. However, I can't imagine my life without them. I hope to be able to meet even more IRL, but even if I never get that chance, I know that in my computer live some wonderfully awesome people that I can lean on, and in turn offer my shoulder for support. 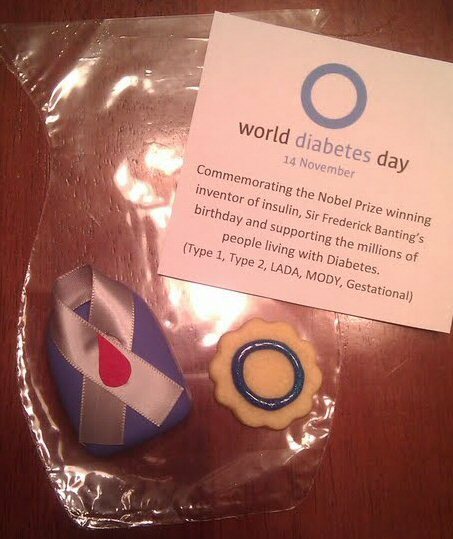 Happy WDD to you and your sweet family... LOVING all the blue in this post! Can I have a cupcake now, please?? 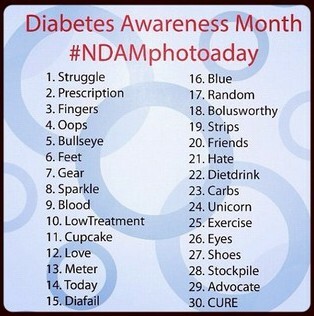 Happy WDD!! That's awesome that Bean's class showed such support!! You guys are rocking the blue everywhere! Yay! Love reading about your daughter!